I’ll have to admit, this started life as more of a technical challenge for myself rather than any particular feature request but you can see that this could be the starting point to providing RaceShape style comparisons between your own activities and comparing multiple, similar activities has been an often asked for feature. Before anyone gets in touch saying that it isn’t matching activity X or it is taking too long to run then please make you’ve read and understood everything in this blog post first! Due to how it works there is a trade off between performance and accuracy and it is never going to be 100% perfect and if you’ve loads of data or running on a low spec device then performance is probably going to be an issue. I probably won’t reply to people asking questions where it is clear they haven’t read this post fully! Go to the Activity Details page for any of your activities (or someone else’s if their data is set to public), Swap to the “Overlaps” tab and select a section of the activity (using your mouse or finger on the elevation profile). After a bit of number crunching (see performance section below) it will provide you with a list of the closest matching activities for that selected portion of the activity. Those activities are also displayed in the map along with the selected section of the context activity. The order of activities on the list is based on how well it matches the selected section of the context activity. Hovering over the items in the list highlights that activity on the map. Potential for the future would then be the ability to navigate to a activity comparison page between the context activity and one of those in the list although I’m not promising anything! If you look at your Activities List page and turn on the map you see a kind-of heat map of everything you’ve done. 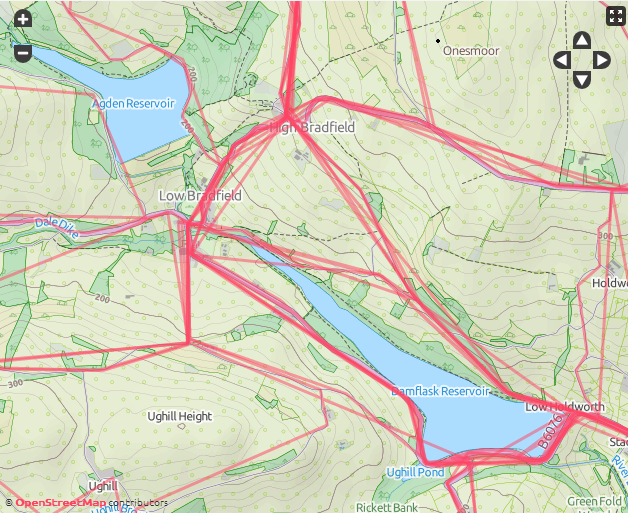 Strava provide a summary view of each activity’s route which is a really simplified view attempting to show the route as well as it can using as few data points as possible. If you zoom right the way in you’ll see trade off of this approach but for what it is designed for this is perfectly understandable (see image where wiggly roads are often represented as straight lines and some large sections are missed entirely). This summary route of each activity is what I use to compare against to work out which activities best overlap the selected section of the context activity. 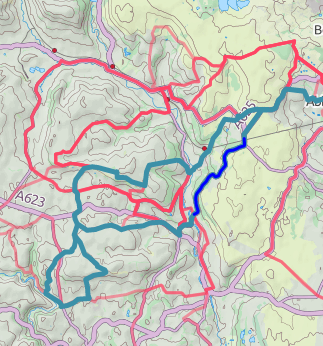 Seeing as the selected section is using the full, detailed route (I actually simplify it a fair bit it for performance reasons but not as much as these summary routes) then how well each activity overlaps is dictated by how simplified their routes have been in their summary route. So you might well see the context activity itself appearing some way down the list despite the selection being from itself due to how its summary map has been calculated. In order for this functionality to work at all it requires access to your full list of activities including their maps. Fortunately I already cache this locally in your browser’s local storage whenever you visit your Summary or Activities List page. You will get a message displayed if this cache isn’t available. The number of activities you have in the system – obviously the more activities you have in VeloViewer the longer it will take to check through them all. I do attempt to filter out those that will never overlap but if you always log your commutes and pick a section in that same area then expect it to take some time. The length of the section you select – the longer the section of route you’ve selected to match then the more data points it will need to check for each activity so the longer it will take. The performance of the device – running this on your phone on an iPad 2 will probably struggle. It will work but you’ll need to give it a bit of time. iPad 3s are much faster than 2s. There is certainly a possibility for me to make this functionality far more accurate by creating my own summary routes which are a bit more detailed but in order to do that requires having the full lat/lng details first. This isn’t something I will be doing in bulk but is certainly a possible improvement for me to bear in mind. The trade off for that (given that I could get hold of that data easily in the first place) would be that with more data points in the summary views, more processing would be required to make those matches. Nice. It opens the possibilty to compare all similar activities in your list and not having to create segments. Great feature Ben. And I was surprised by the speed it works, although for longer sections it may be a bit slower. I’m looking forward forthe expansion of this feature, data like the split time it took for the sections during the activities that are displayed in the produced list. No comment but only a positive reaction, I can imagine that this takes a ot of your time. THX for all the work you do. Nice feature! 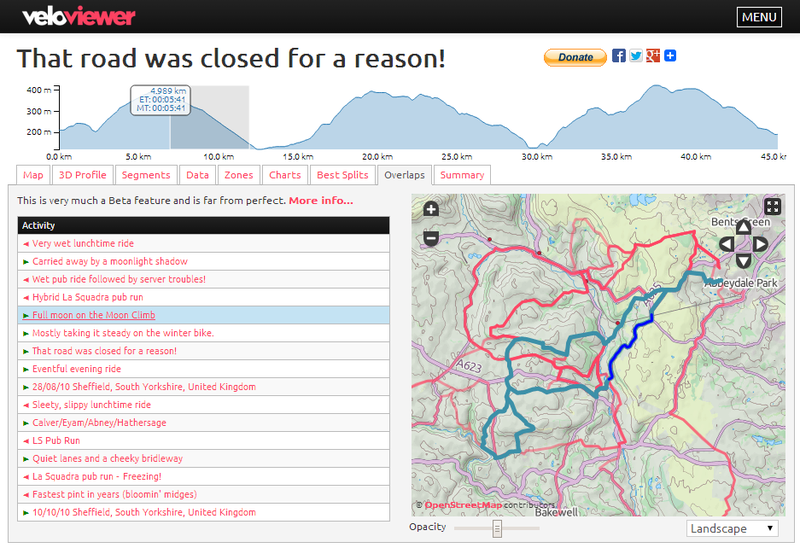 I actually see a ton of possibilities in the inverse of this: what are the popular routes you haven’t ridden yet? With so much great riding out there, it’s difficult to know sometimes what I’ve missed (yes, Strava’s Route Builder tool helps some). I’d love it if you could use this to build out a list of the most popular segments near X place that you haven’t ridden yet. As always, thanks for geeking out on this as much as your users do! I’ve been wanting to do something like this since I started VeloViewer! One day I’ll get there if I can make it scale. How about using this to display number of unique miles ridden? So you can compare who of your friends has covered the most of the country/world. I was thinking about that sort of thing shortly after creating the VeloViewer Score. A way to rank people based on the amount of ground they cover. Perhaps I could just have a grid of the world and count up the number of squares that you’ve ridden (maybe a smaller grid for running). That would be an easy way for people to see how they can tick off more squares. How to delete , my veloviewer account , ( I’ve managed to unlink it from Strava, yet it shows my veloviewer score to my contacts . How to remove my veloviewer score. If you delete your VeloViewer details (on the Update page) then it will now delete your scores as well so should no longer appear for any contacts.